A beautifully restored Historic home on Indian Pass, Jubilee Cottage is the ideal place to create wonderful family beach memories. Spend hours laughing on the front porch with friends with the sound of the surf to keep you company. Originally a dairy farmhouse, the home was built in 1910. In 2005, the cottage was relocated to Indian Pass from Port St. Joe and lovingly restored. The renovation preserved all of the cottage’s original charm while adding every modern convenience. Early 2010 brought even more renovations. New furnishings, linens, and appliances dress up the home just in time for its 100th anniversary. The quiet beach of Indian Pass will make you feel like you have found the last undiscovered beach on the planet. Spend your days lazing in the sun, building sand castles, or watching for dolphins. Plan to build a beach bonfire one night for roasting marshmallows, chasing Ghost crabs, and counting stars. Sea turtles nest in the area from May-October and Turtle Patrol Volunteers take turns early every morning looking for signs of a new nest to secure. Love to fish? Charter a boat at the Port Saint Joe Marina for a deep sea adventure, put your own boat in the water at the Indian Pass Campground boat launch a mile down the road, or enjoy casting and catching from the shoreline. Not to be missed is the famous Indian Pass Raw Bar a few minutes from the house. 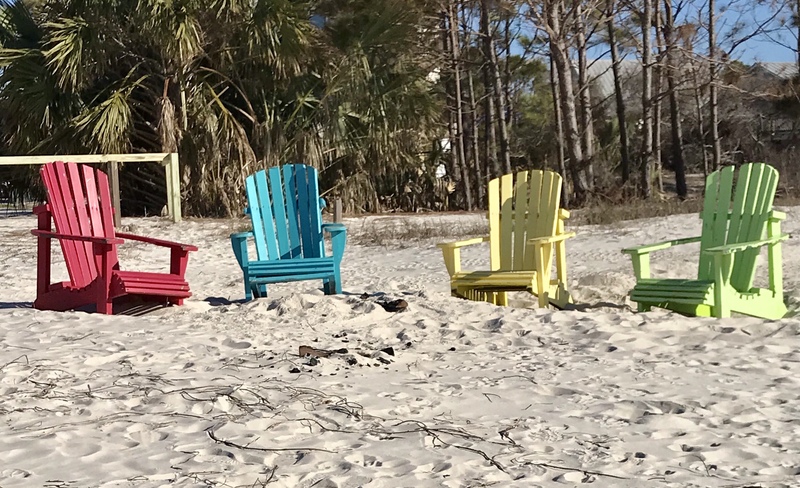 On an honor system, help yourself to a cold beverage in the cooler, grab any available chair, and catch up on the latest gossip along the Forgotten Coast with the locals and folks wishing they were locals. Fresh oysters and shrimp caught in the area’s waters are served along with quite a few hot dogs. While the beach is the highlight, the cottage is right in between Port St. Joe and Apalachicola. Both towns offer plenty of restaurants and shops to explore. The Owl Café is a favorite restaurant in Apalach for lunch or dinner. Spend time browsing through the historic Grady Market and you will surely find something you just can’t live without. Head West on C30 to visit Port St. Joe. Visit the Farmer’s Market along Reed Ave on Saturdays in the summer, catch an outdoor movie, or head over to the School of Fish restaurant for a cocktail and the best sunset view along the coast. We love to cook and the kitchen is a chef’s dream. A professional gas range and oven, stainless steel cabinets and prep areas along with new gadgets and appliances are highlights. The Big Chill Retro Refrigerator is a nod to the vintage kitchen that once graced the cottage. Enjoy dining on the screened porch just off of the kitchen. The living room has plenty of space for your family to chat, grab a book, or cheer for your favorite team on the flat screen TV/DVD. The sofa pulls out to a double bed when additional sleeping space is needed. The cottage really has two master bedrooms. Bedroom one has an elegant peacefulness. The attached bathroom has a large shower with an antique stained glass window for light. Bedroom two has crisp white linens and a pop of bright colors here and there. The attached bathroom has a tub and shower. Both rooms have queen sized beds, TV/DVDs, and IPod stations. The third bedroom has a fun Americana theme with two twin trundle beds. This room can also be used as a second living area with TV/DVD, games, and toys galore. The back porch has a private outdoor shower perfect for hosing down sandy kids, dogs, and husbands. Speaking of dogs… four legged family members with perfect manners may be able to join in the fun. Special approval, and fee required. Well behaved owners are allowed to bring their dogs on the beaches of Indian Pass. We have been here since January 7 and have loved the beach, the neighbors and the cottage. It is quaint and homey. The porch is to die for. We will be back next year. We really enjoyed our stay at Jubilee Cottage. Everything was just perfect and the grandkids loved the beach. Pristine did a wonderful job ! We arrived late and had some issues but they came right out and made things right! Anything we needed they were very helpful! We had a very nice time here the house was accommodating and well stocked... And the beach was perfect!